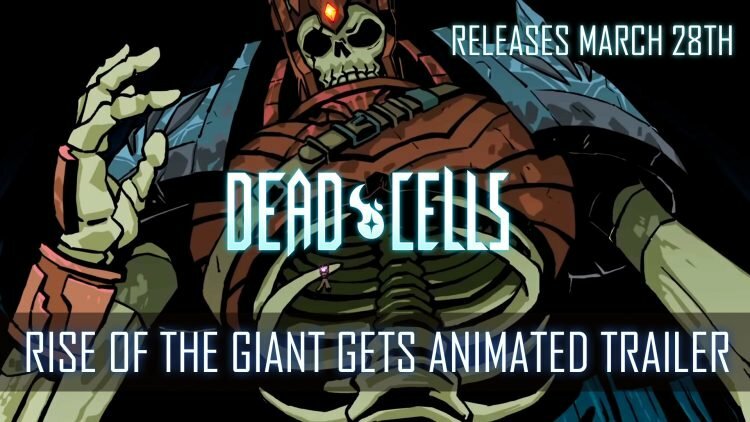 New trailer from developer Motion Twin for their upcoming free DLC for Dead Cells: Rise of the Giant shows off new larger than life boss in all its animated glory. The next update for Dead Cells comes in the form of a free DLC called Rise of the Giant. A new animated trailer features the main character The Beheaded as he zips away from numerous new foes, finally meeting his match with the colossal skeletal boss. Not only do we see new challenges but new items, weapons and levels that are coming with the DLC. Even the most experienced players who have beaten the game once, can endure more incredibly horrible deaths as there are new lava pools and caverns to discover, facing new enemies to battle against. Be rewarded with the new skinning system which adds a further 50 new character outfits to adorn while dying over and over. Dead Cells was originally released on Steam Early Access back in 2017, where it quickly found its own audience of rogue-like lovers who enjoyed its well polished design. The game has since picked up dozens of accolades worldwide, from international critics and gaining commercial success for the developer Motion Twin. Fans will also get to experience the Rise of the Giant update with a hands on at PAX East 2019 which takes place later this week from March 28th to March 31st. You can find them at booth 16097. Dead Cells upcoming DLC update Rise of the Giant will be launching on PC via Steam on March 28th. For more details on the Dead Cells upcoming update read about it here in Dead Cells Gets Free DLC Rise Of The Giant. You can also check out Dead Cells Sequel Unlikely Says Devs.